Since staying the night, I've been left 100% wishing all hotels had self-service check in/out kiosks; the process took about a minute or two and didn't involve listing a ton of details over a desk. Perfect! There are always a couple of members of staff around to help you out anyway, should you not be tech-savvy. Speaking of which, the staff are so friendly and cheerful - a pretty nice way to be greeted, that's for sure. 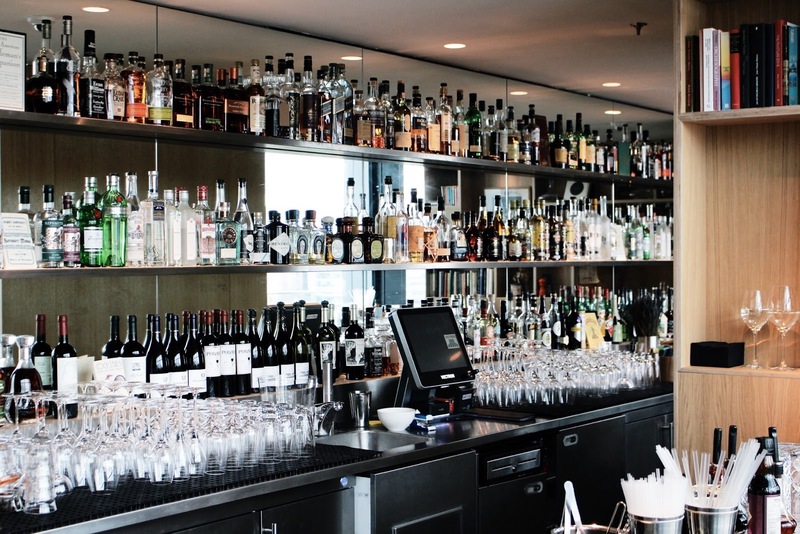 Knowing about the rooftop bar, I headed there soon after checking-in. What I had anticipated was impressive city views, what I hadn't anticipated was the mass of inspiring artwork. 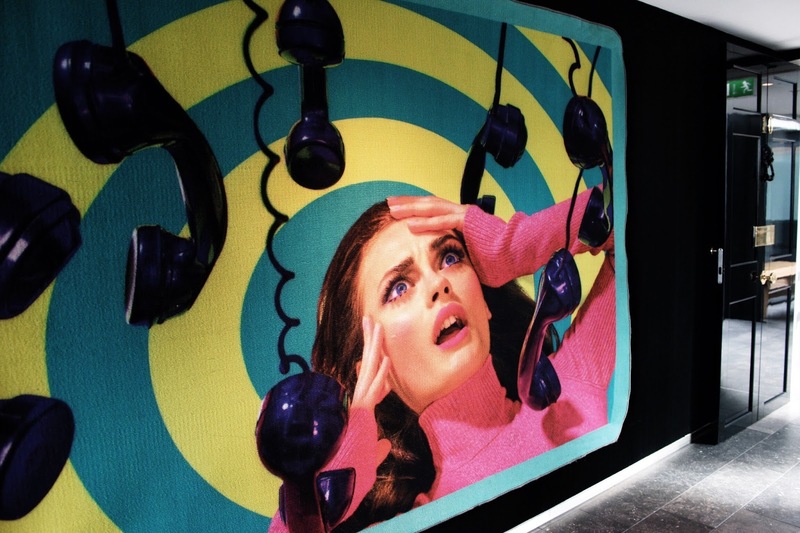 The entire citizenM Tower of London Hotel is decked out with bright and unusual artwork at every turn - some of which I've shown in this post, though I've kept it to a minimum to avoid too many spoilers! Also, above the bar, there are a few library areas packed full with books in various languages and tons of seating. My advice? Take yourself up there (with a drink) for an hour or so to enjoy that book you keep forgetting to finish. Standing up and twirling hair, optional. But can I take him home with me? 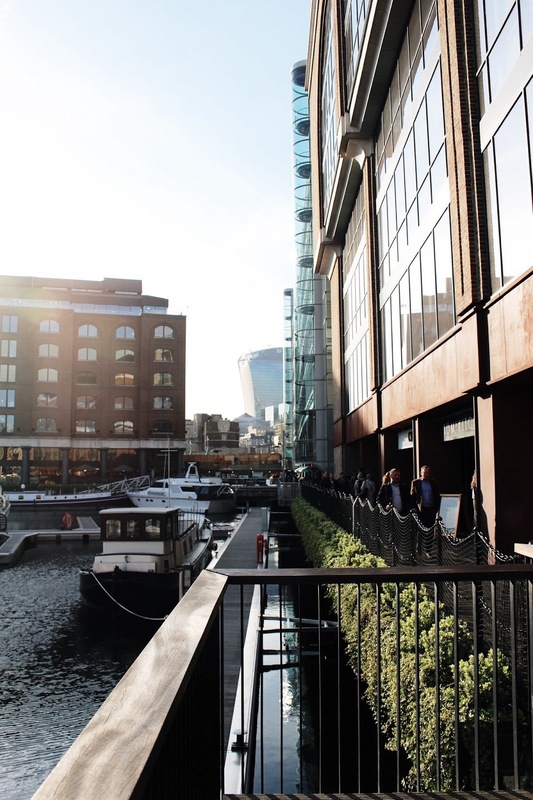 Somehow, I've never managed to check out St. Katharine Docks before, and so considering the area is just a 5 minute walk from the hotel (wrapping around Tower of London), it seemed like the ideal opportunity. 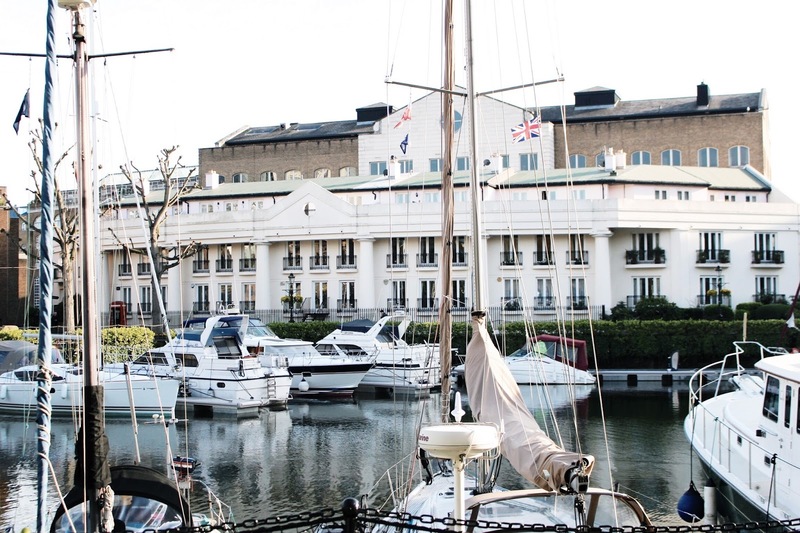 The weather was on its best behaviour and created the perfect moment of eating dinner in the sunshine, overlooking yachts bobbing in the docks. 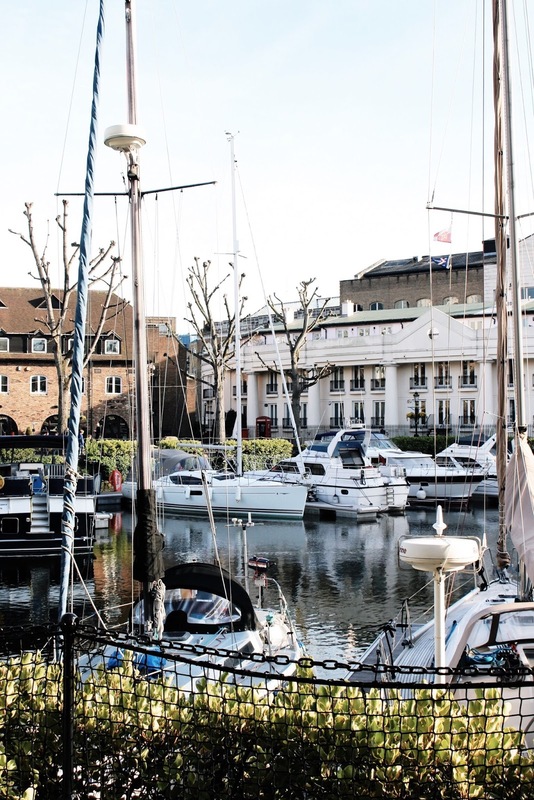 Life isn't all about the gram, but St. Katharine Docks is a good place to start, right? After dinner, it was straight back to the hotel to make the most of people-watching from the hotel room. 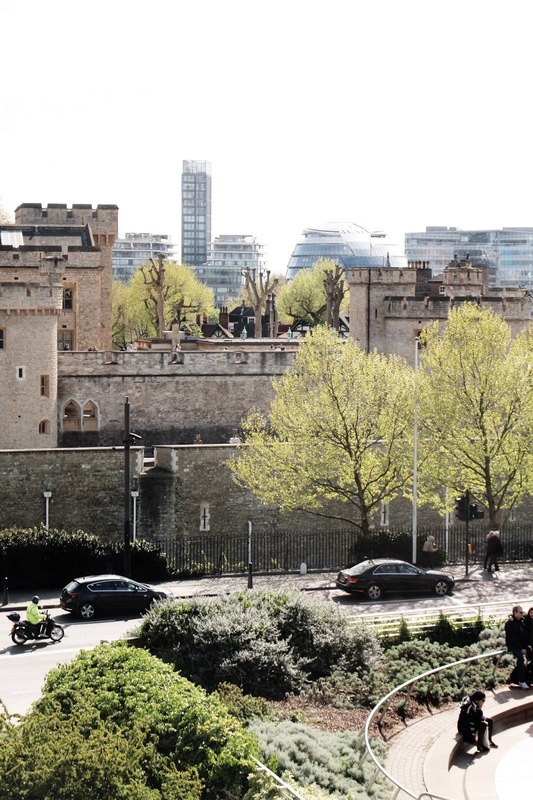 When checking-in, you can select which room's view you'd prefer, at which point I opted for a room with a view of the Tower of London. 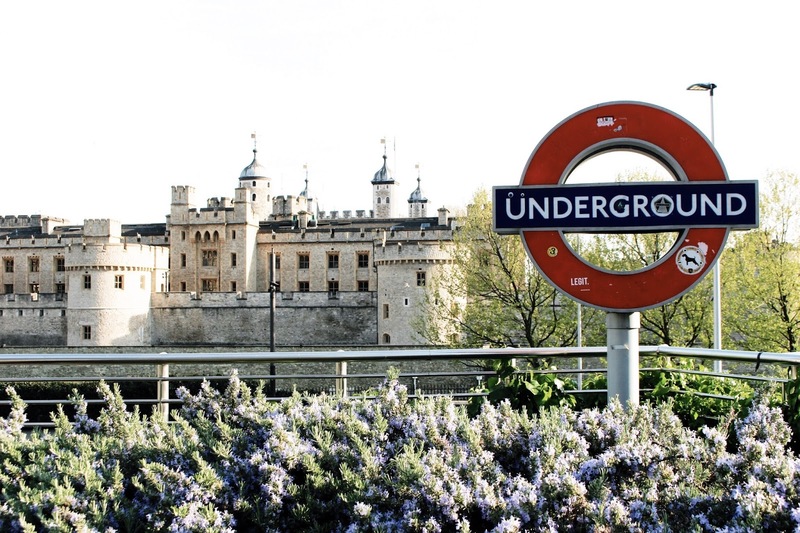 It provides a clean view of the historic site, as well as the entrance to the tube station. And believe me when I say this makes for fascinating viewing! 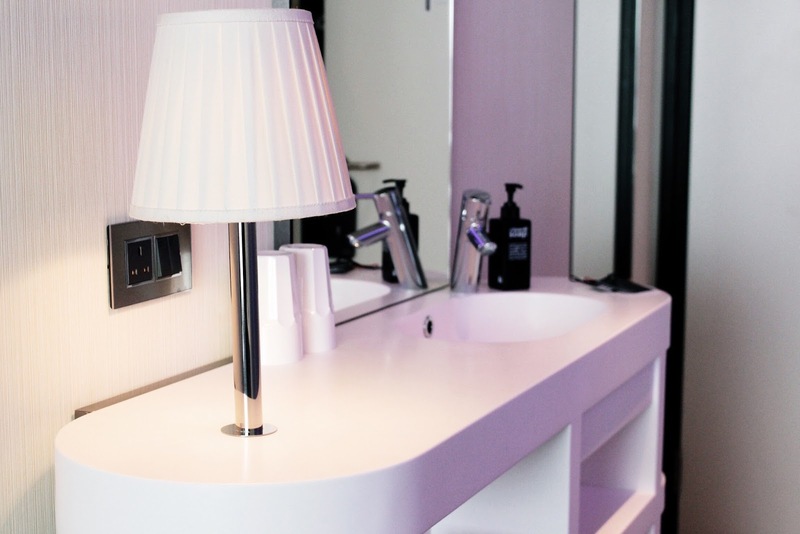 One of my favourite elements of the stay was the iPad-controlled mood lighting in the room; you can very easily change the ambience and create a cosy, and yet still modern, environment. Everything in the room is controlled by the iPad, including temperature, blinds/curtains and more. Psst! To my readers who aren't so keen on people-watching, don't worry, the windows/walls are very well sound-proofed. It's like living in a bubble. The morning felt beautifully calm and with free Wi-Fi and movies (I know, amazing! 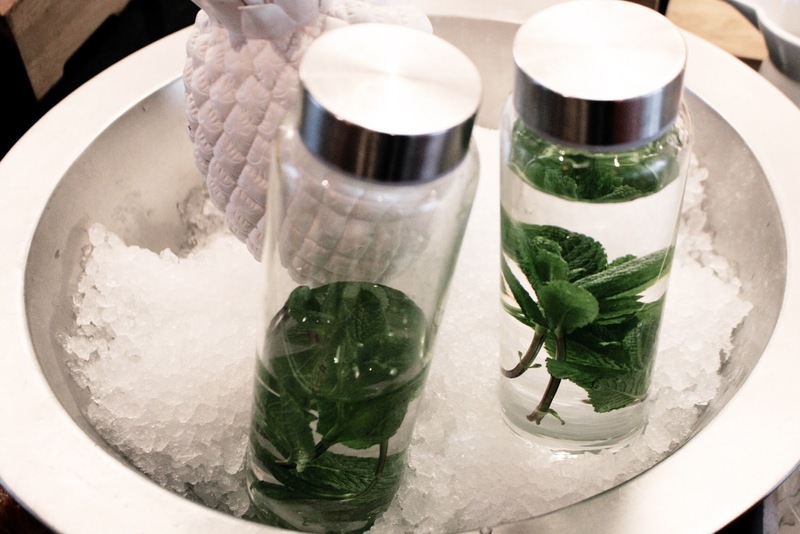 ), it's easy to whittle away a few hours without even leaving the hotel room. Which is exactly what I did, meaning I had to chuck some clothes on for breakfast in about five minutes. Oops! Breakfast is served in a canteen area on the ground floor. My choice? Croissants with raspberry jam. I took the opportunity to roam around the ground floor and spotted quite a few areas I could see myself comfortably sitting down with my mac and getting stuff done. Speaking of which, you can expect plenty of business travellers at the citizenM Tower of London hotel, mixed with tourists and the occasional couple here and there. 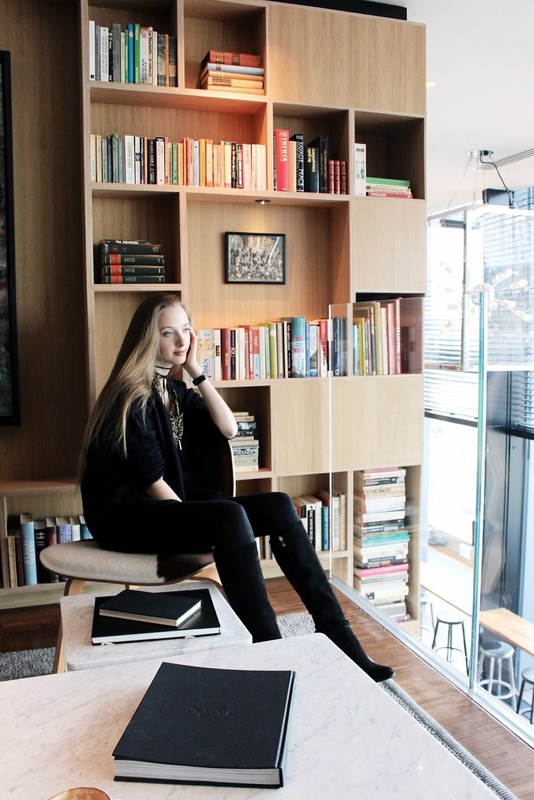 I absolutely loved my time at the citizenM Tower of London, and I suspect that has something to do with how the hotel combines some of my favourite aspects when travelling - unusual interior design, amazing views and a streamlined experience. Let me know in the comments below what you think of this hotel! Note: I was invited as a guest of citizenM Hotels, however all opinions are my own. Un soggiorno tra modernità e passato. I absolutely love the view that you had of the Tower from your hotel room!! The hotel looks absolutely gorgeous and is in such a great location! Love the view! And those balloon animals! You look gorgeous as always gabrielle. Looks like a lot of fun! The view from this hotel is beautiful! It's really well located too, I really like that area of London (surprisingly, for me who usually prefers less urban backgrounds.) The self-service check-in is indeed a great idea, makes it so much quicker! Plus choosing your view is a great advantage. I love people-watching too! Wow! It looks so perfect! I keep trying to come up with something I would miss when staying there, but nothing comes to mind. Location, design, staff... Sounds like a dream. 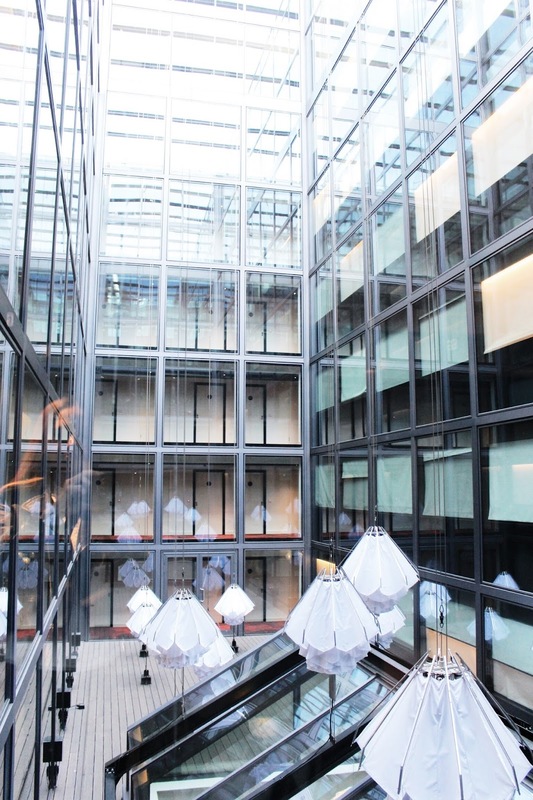 I have stayed at two Citizen M hotels and I loved it! This looks like such a dreamy hotel - that view! Love how slick everything is as well. I've actually never been to St Katherine's Docks either but I've seen so many people post pictures and it looks gorgeous! 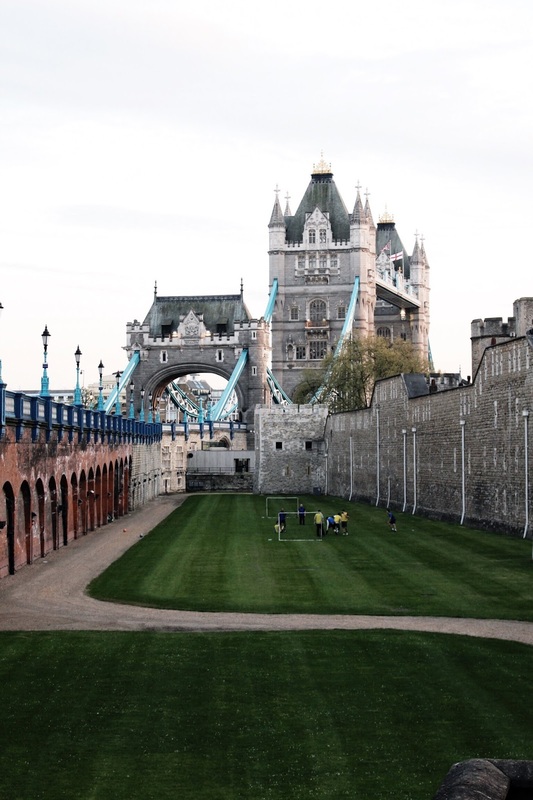 I love all the British features with the Beefeater and statues, such an amazing view of The Tower of London too. I have never stayed in a Citizen M Hotel but may check them out as looking for a hotel for the UK Blog Awards this Friday. I love this post Gabrielle! My in-laws were staying at the hotel next door just before Christmas so we popped in for a drink but I had no idea they had a rooftop bar!! We had a drink in their bar on the ground floor but I was totally enamoured with their artwork. Citizen M looks like such a fun hotel to stay at and those views - LOVE!! Sweet hotel! I would have loved people watching as well and that library looks interesting and so cool to have in a hotel. I always try to look for quirky or unusual design when looking for places to stay during a holiday. It just makes the experience more special! Oh and a good croissant is always a good idea for breakfast! Lucky you girl!! This looks like a fab hotel to stay in. Great and lovely shots. Wow! WOWOWOW!!! Your pics are everything! U look soo gorgeous tooooo! The hotel pics are outta this world stunning! Happy EASTER weekend! What a gorgeous hotel! It looks like the perfect base for adventures in London though one could probably get up to some lovely adventures on the hotel itself just based on your stay there! Happy Easter Gabrielle! What a cool looking place and such a great location, I love St Katherine's docks! Oh wow the view you picked is stunning! 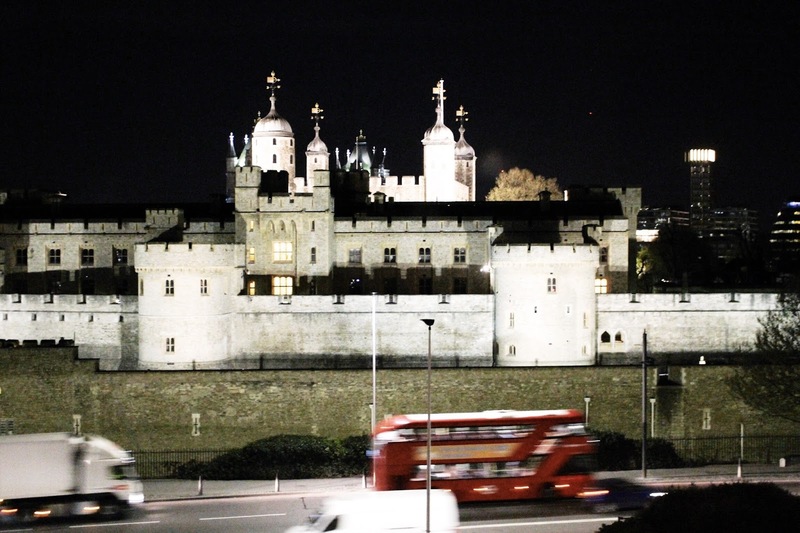 I've never seen the tower of London before (I've not been to london too many times) and it's always been somewhere I've wanted to see, I love the idea that the lighting is controlled by an ipad too, how exciting! I'd love playing around with that. What a gorgeous hotel. Love tha fact that everything in the room was iPad-controlled. Those cupcakes look yummy, by the way. How fun ! Great location ! Love these pictures ! Wow Invited to stay in this gorgeous hotel! Fabulous experience and in the heart of London. The photos are fantastic sweetie! It sounds like a beautiful place and I love the decoration! I really want to go back to London now! Self-service check-in and out kiosks are genius! Who wants to deal with that awkward exchange at the front desk, I know I don’t. The rooftop bar is impressive, crazy impressive. It looks modern, inviting and cozy. 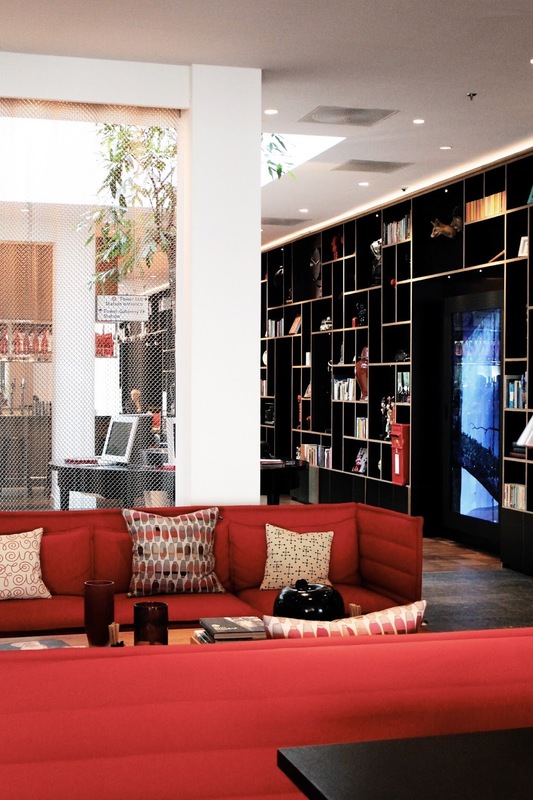 I have to visit the CitizenM Tower of London, it looks to good to be true. Wow, that hotel looks amazing. It's probably one of the coolest hotels I have ever seen. It looks like you had such a dreamy stay there. The view is amazing! It's so nice to stay somewhere that feels like home yet still has all of the nice amenities and features. Love it! The hotel as such an amazing design! I love it! 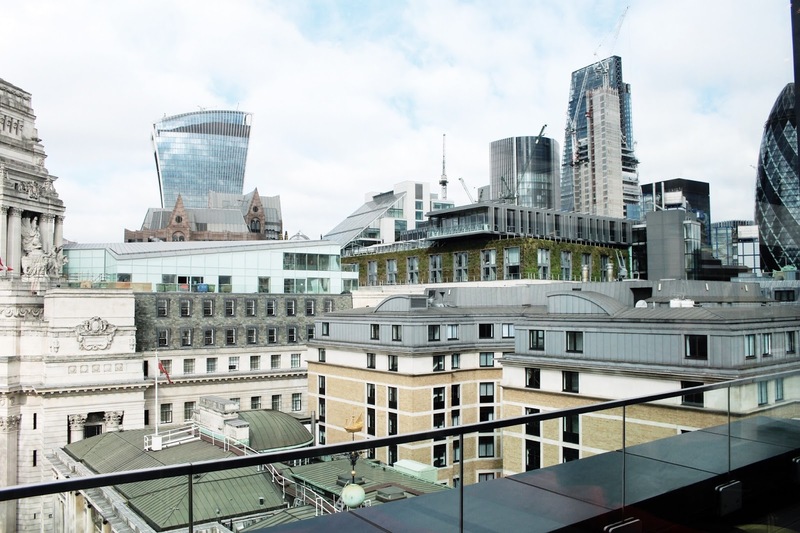 Whoa, this hotel has some seriously lust-worthy views of London! How exciting they invited you to stay there. Glad you had a great time! With views like that, I'd definitely people watch all day long haha. This looks like such an incredible hotel to stay at! I love the way they decorated it, and of course a rooftop bar is always a good time. How has no one thought of self service check in before?! That's the best idea ever because everyone uses it at airports and they have it in a lot of supermarkets in Australia and I always use it because it's so much quicker. It makes sense that they have it in hotels because a lot of time all you need is to get your key and you're ready to go. Sounds like an amazing experience, Gabrielle! The hotel looks modern and the location , ideal. Plus it's always nice to know that the staff is kind and lovely. Loved how convenient their check-in service sounds, and of course, my favorite part: that gorgeous view from the rooftop and your room. Is it just me, or have you not done a hotel post in awhile? I've missed them. This one looks like a gorgeous place to stay, and what a view! The area seems like a perfect mix of old and modern. The view alone would make this hotel worth a visit...What a stunning view it is! Perfect for people watching! The interior is rather gorgeous and it does have that homey and cozy chic appeal doesn't it? However, the books and the art displayed that were what really got me! I can read in quite a few languages, so the aspect of being able to sit down for an hour or two and flip through pages of books written in various languages really appeals to me. Lovely photographs...you always look dreamy. Ooh we've been here for coffee! We wanted to see the rooftop bar but it's rightly kept just for those staying at the hotel. 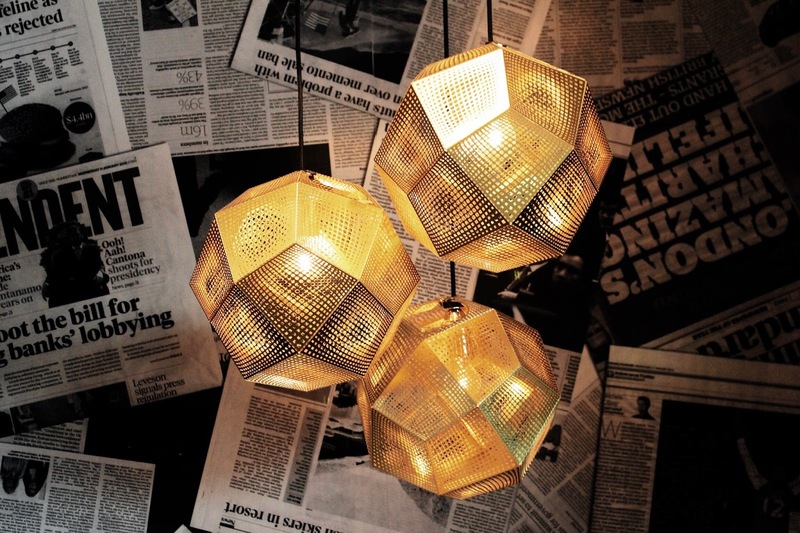 Love the funky decor there and your review really does it justice - great shot of you and the beefeater! This hotel looks great and the location seems brilliant as well, this post actually reminds me that I haven't stayed in a hotel in what seems like forever! Wow, it really seems like a lovely hotel! I love their decor. The artwork is absolutely beautiful and so fun and I also love that they have a book range in many languages, so there's something for everyone. I also must add that I'd love to stay at a hotel that has self check-in/out, I'm sure it was so quick and easy! Thanks for sharing, beauty, and I hope you have the most amazing week ahead! 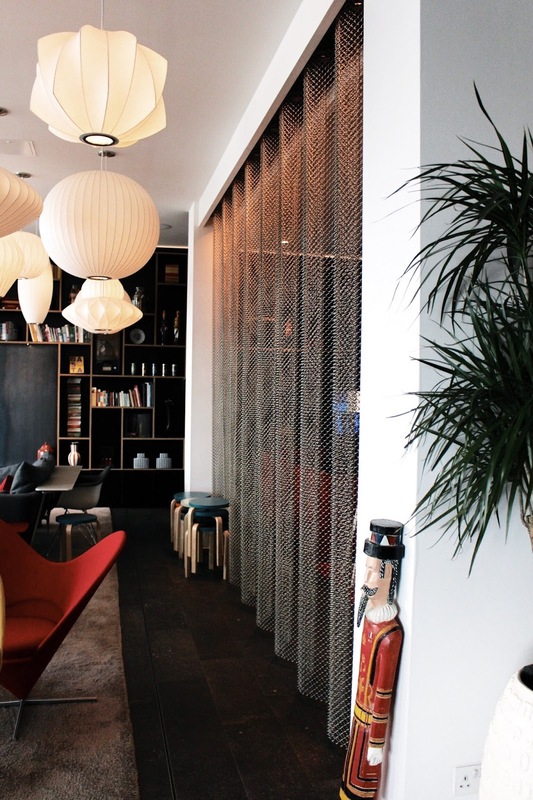 I bloody LOVE the Citizen M hotel - so, so dreamy and such a great location too (my train from Essex comes into Fenchurch Street so it's so convenient!). I'm also a huge fan of St. Katherines docks, I've only had dinner there once but it was so lovely! 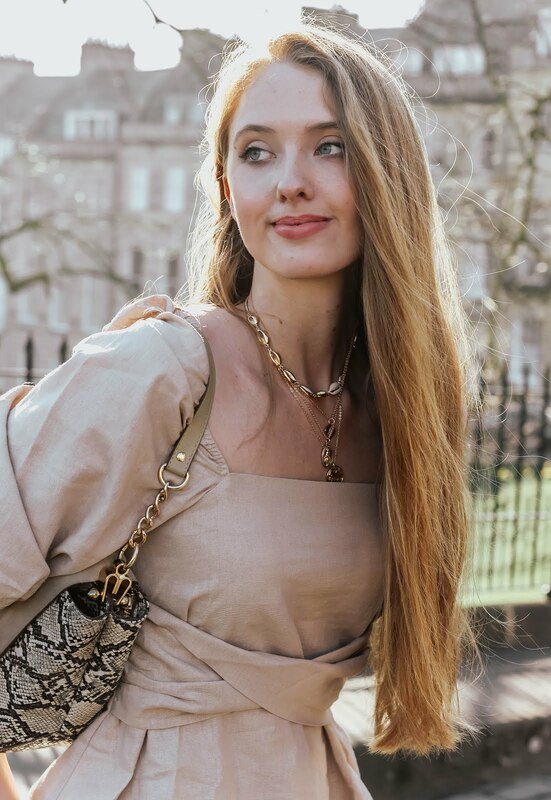 Great post lady, hope you had the BEST Easter weekend! This hotel looks amazing! I love all the modern decor, and the view from your room is stunning! Such a stunning hotel!! Absolutely dreamy and transport me to someplace far, far away... I love your travel posts! 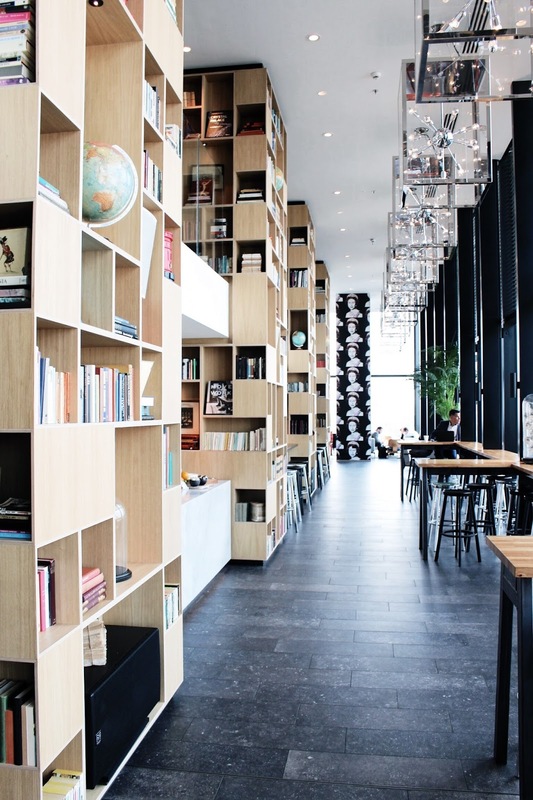 This is possibly my favourite Citizen M hotel in the world. Such a decent building and quite a convenient location, too! This hotel looks amazing! I love quirky, boutique type accomodation. They always feel more homely. You got some amazing photos! Hope you had a lovely Easter! Oh Wow! What a stunning, clever hotel! Shall definitly be checking this out! As always your photos are amazing. The hotel looks stunning and super stylish!!! Plus the views are awesome!!! Looks like you had a brilliant stay and I do love rooftop bars! For some reason I do find rooftop bars to be slightly pricier than normal bars but hey, the view is usually worth it. 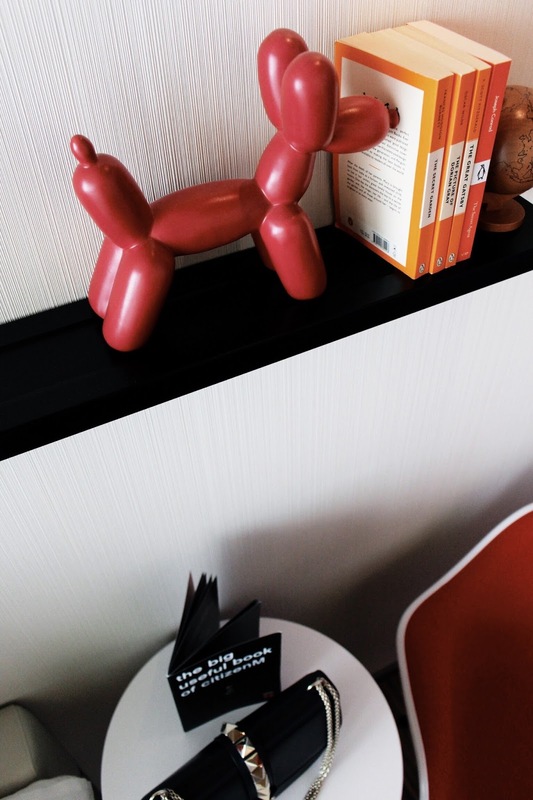 What a quirky looking hotel, I like the modern day decor and quirky touches such as the dog bookends, how cute! Chocolate cupcakes, well that's a winner just there isn't it, it's those little touches we remember when reviewing hotels! Love your black lace robe from Asos, really very feminine and suits you, and you look quite at home in your hotel room there! Great photographs and like the shot of London with the red bus going past. Great picture as always !! 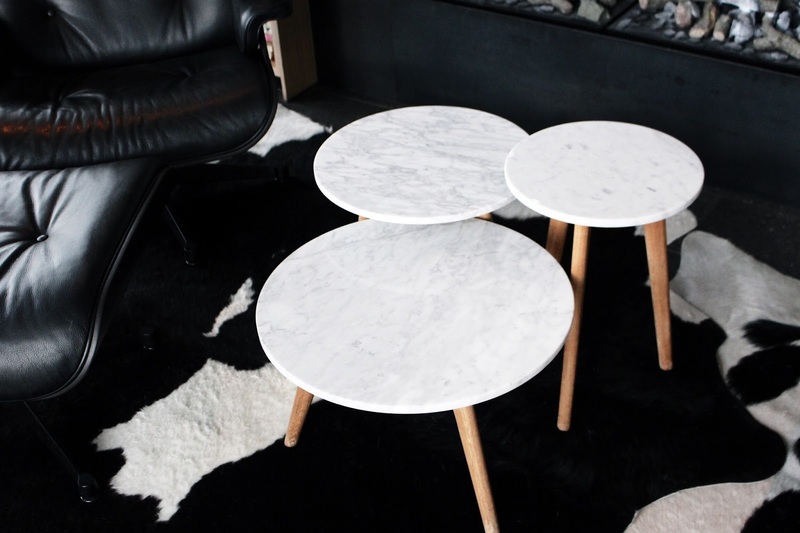 It has a great modern & sleek design. 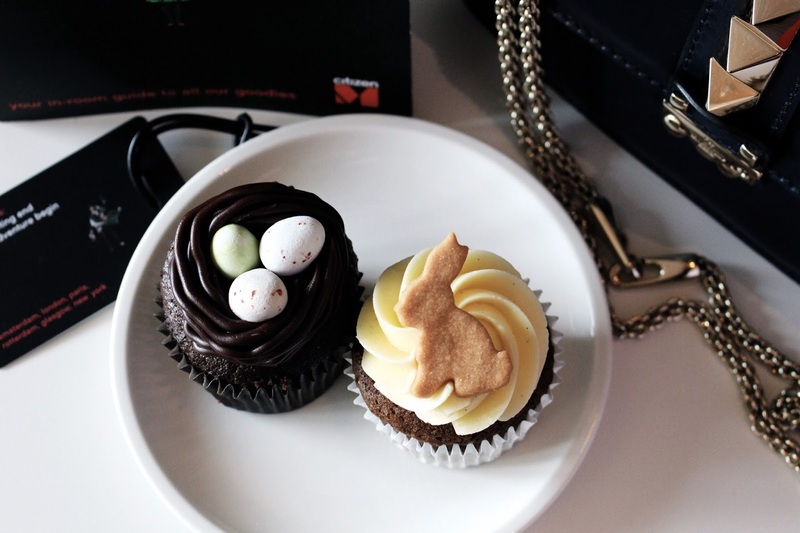 Love those cupcakes.